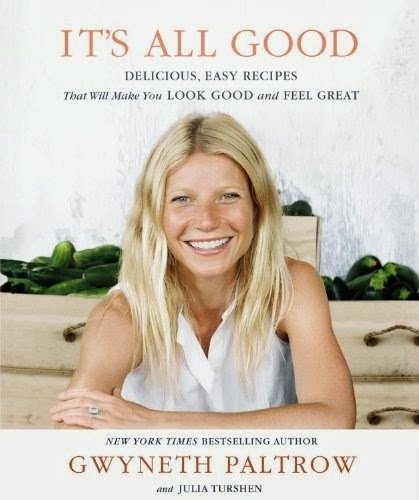 I reviewed The Honest Life earlier this year, so when I saw its main “competition” in the healthy lifestyle arena, It’s All Good by Gwyneth Paltrow, on sale, I snapped it up to review. There has been a lot of press surrounding this book, even before its official release, with most of it being fairly negative, which partly why I didn’t buy it when it first came out . Accusations of it being elitist, unattainable, and containing more fluff than stuff have been flying thick and fast, and some of it is indeed justified. However, overall, I really liked this cookbook, and plan to make many more recipes from it. Firstly, I am going to cover the fluff. Yes, as had been endlessly reported, this cookbook does indeed include a “recipe” for a boiled egg, fried eggs, and avocado on toast (literally, avocado. on. toast). These are not, in my opinion, recipes, and really have no place in any cookbook other than that aimed at raw beginners (I’m thinking, cookbooks that my kids read!). Had Gwyneth left these fillers out, I think she would automatically cut out half of her detractors. But don’t let those three pages take away from the rest of what is actually a really good cookbook. Don’t get me wrong, this book is not for the millions of people following the Standard American (Australian) Diet. Unlike her previous book, this cookbook is aimed squarely at real food proponents, and this is probably where the disconnect has happened. Review after review has complained about hard to find/ridiculously expensive ingredients, but I can honestly say that after reading through every single recipe, I already had most of the ingredients, and the only ones that I wouldn’t be able to find were the Mexican ingredients, which I am assuming are probably easy to find in the US, even if that is not the case here in Oz. The things I didn’t already have on hand were the gluten free flour mixes (since we are not gluten free) and the oft used Vegenaise, but a simple swap for regular flour and mayo solved that problem. For those who eat the standard American diet of highly processed foods, then this may not be the case, and some of the criticisms may be valid for them. Eating real foods can be more expensive, there is no way around that, but as most real foodies will attest, that small investment in real food is often seen as a large investment in health. Which brings me to the $30 omelet, and the $300 a day meal plan – I just couldn’t get these numbers to add up. Yahoo costed the omelet using duck eggs at a dollar a piece, and I’m not disputing those figures, but her recipe clearly reads “4 chicken or duck eggs”, and I’m thinking that most readers would surely use the much less expensive chicken eggs if they don’t have an intolerance to them like Gwyneth supposedly does. Plus, it appears that for each recipe, they have included the cost of the entire ingredient – that is, an entire bottle of maple syrup at $15 for the crumble recipe, when the recipe asks for 4 tablespoons. This may be a argument if you are going out and buying an ingredient just for this recipe, but firstly, I personally don’t think you should cook that way, and secondly, surely you could apply this “logic” to any cookbook and you would come up with the same result. Chicken Soup with Kale and Carrots – super, super yum, which I made tonight since both kids have got terrible spring colds (what do you expect, our weather has varied from cold and stormy, to hot and steamy!). I left out the kale, and added a large handful of noodles. Egg White Omelet with Spinach and Mushroom – super quick to make, and very tasty. I served it with sour dough toast, and it made a filling and delicious breakfast. Leftover quinoa, a bit sweet – I have leftover quinoa sitting in the fridge at least 2 -3 times a week, since it is a great high protein substitute for rice, so this was a wonderfully different way for me to use it. I would only loosely call it a recipe (you are basically combining quinoa and almond milk, heating it and topping it with various things), but it certainly inspired me to try something different for breakfast. Cleo’s Afternoon Shake – yes, this is nothing more than an a real food version of a banana milkshake, but it was delicious, the kids loved it, and as an afternoon snack it stopped them from constantly raiding the fridge before dinner. It’s since become a regular afterschool treat. If you have a real food orientated household, or if you don’t but are interested in moving towards one, then I highly, highly recommend this book. Do I agree with all her nutrition ideologies? No, my family still eats gluten, dairy and a whole lot of genuine crap, but I am trying to have us eat in a more clean way, and the recipes in It’s All Good look so tasty that I don’t think any of us will feel deprived doing so. I can’t wait to try out a lot more of the recipes!